Solar power technology is now mainstream with the proliferation of affordable solar panels, but it’s been around since the turn of the century. French physicist Alexandre-Edmond Becquerel discovered the photovoltaic effect which led to the invention of the first solar panel cell in 1941 by American engineer Russell Ohl. The solar industry shot at a rapid growth during the recent decade at an average annual growth rate of 68%. As of 2017, California topped all other US states in its use of solar power. Its overall solar energy system can power a whopping 3.7 million homes. While the initial price of solar power installation can be steep, 5kW of solar panels added to your home can raise your property value by up to $29,555 or more. Not to mention the monthly savings from your electricity bills which will eventually pay off your initial investment of installing the solar panels. Monocrystalline solar panels are among the most common types of solar panels that you will see on the market. These solar panels are good options when you need something that is reliable and capable of providing you with clean energy. The process of gathering energy with these solar panels is very efficient overall. It has the highest rate of efficiency among commercially available solar panel types. Twenty percent of the energy that is captured by these solar panels can be converted into electricity. Some of the more recent monocrystalline solar panels are even capable of exceeding that 20% statistic. The efficiency of these solar panels is increasing as the technology becomes more refined. This is generally the best type of solar panel that you can purchase today when you want to power your home. Solar panels such as this are very convenient because they are small enough to be practical. You don’t need a whole lot of space to be able to set up one of these solar panels. It has a very high power output and is capable of lasting for a long time as well. There is a downside to all of this, though. Monocrystalline solar panels are the most expensive type of solar panel on the market, generally speaking. They are excellent at providing you with energy, but they are not inexpensive. This means that they may not be the most practical option for everybody out there. Even so, you can find monocrystalline solar panels out there that aren’t exorbitantly priced. If you look for a good deal, then it will be possible to purchase monocrystalline solar panels for your home. The monocrystalline solar panel that is being shown off here is a complete starter kit that has everything that you need to begin. It’s a convenient way to introduce yourself to using solar energy and is fairly easy to make use of. If you have been thinking about getting into solar panels for a while now, then this is a good option for you to consider. Polycrystalline solar panels are also quite common and even have a few advantages over monocrystalline solar panels. If you want to save yourself a little bit of money, then buying one of these solar panels is a good decision. They are a bit more cost effective than the monocrystalline solar panels while still being able to provide you with plenty of energy. These types of solar panels are commonly used on people’s homes and in many solar-powered products. Making these solar panels is so much easier and less expensive than it is to make monocrystalline solar panels. You can make polycrystalline solar panels by melting down raw silicon. The process is very fast and it’s a lot simpler overall. Less money has to be poured into the production of these solar panels and those savings are passed down to the consumer. The negative aspect of polycrystalline solar panels is that they are not quite as efficient as the monocrystalline solar panels. You should be able to expect an efficiency rate of around 15%. This really isn’t too bad overall, as it is still a significant amount of electricity. It just isn’t quite as high as the mark that was set by the monocrystalline solar panels. These solar panels won’t last for quite as long either. The way that they are designed is a bit different and they wind up being less durable. You should be able to get a good amount of use out of them, but they aren’t incredibly long lasting. Hot temperatures can wind up damaging these solar panels, which can be a bit counterproductive since they need to be out in the sun. Despite these few negative traits, polycrystalline solar panels are still quite nice. They can help people to power their homes and can also be used as backup power sources. They are a little less desirable than monocrystalline solar panels, but they are close enough to their capabilities that they are a worthwhile purchase nonetheless. You won’t regret buying one of these, so long as you look after it properly. The polycrystalline solar panel that is being shown here is specifically meant for RV’s and boats. It is very convenient to get it set up and it can provide quite a bit of electricity. You can also easily make use of this solar panel for a shed or even a cabin. It has a very reasonable price tag too, which makes it an easy purchasing decision to make. Thin film solar cells are one of the best options that you can consider when you are looking to save some money. These solar cells are very affordable and will still be able to provide you with energy efficiency. They make these cells by placing a thin film that is made out of silicon onto a substrate. They can also use other photovoltaic materials, such as copper or cadmium, for this process. These solar cells are extremely easy to produce so the costs can be quite low. This makes thin film solar cells very practical and people make use of them every day in various products. There aren’t a lot of materials that are necessary to produce these solar cells. It makes everything a lot easier on the companies that make them and this is good for the renewable energies sector as a whole. Thin film solar cells are very versatile, too. There are plenty of different ways to make use of this technology. People can use these solar cells for many purposes due to them being less susceptible to high temperatures. This opens the door to new possibilities and it will be interesting to see how new solar panels develop using these cells. If you take a look at this thin film solar panel right here, you will see that it is very flexible. This is an interesting technology that can be used a bit differently than traditional solar panels that you might be used to. It will be possible to position this solar panel in many convenient ways. Being able to fold the solar panel is definitely an interesting feature, and you should have no problems finding a good use for it. Another thing to know about this thin film solar panel is that it is waterproof. You won’t have to worry about this material being out in the elements. This is a very durable solar panel that will be useful for your purposes. It can be used for a long period of time, so it’s a cost-effective purchase as well. 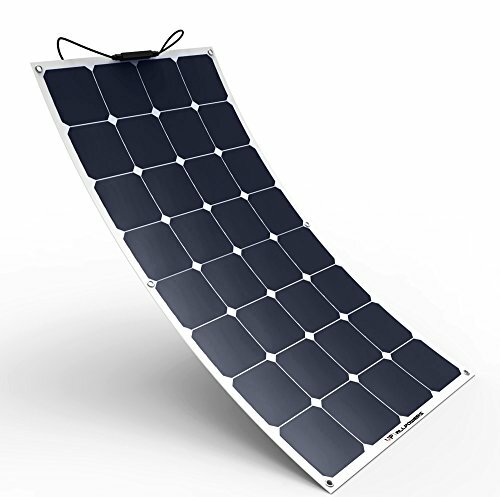 Amorphous silicon solar panels are very common because they are used in many devices. Items such as solar-powered charging docks are becoming more common in modern times. People use solar-powered devices very frequently and they are likely to become even more commonplace in the coming years. The types of solar panels that power these devices are usually amorphous silicon solar panels. This is technically linked to the thin film solar cell mentioned above. There are some differences in how they are created, but they are considered to be in the same “thin-film” category of solar cells. Much like the thin film solar cell mentioned above, the amorphous silicon solar cell is very inexpensive to produce. Due to these solar cells being so easy to make, it is simple for companies to create solar-powered devices at reasonable prices. These types of solar cells and solar panels are not quite as effective as the crystalline versions. Monocrystalline and polycrystalline solar panels have very good efficiency rates. An amorphous silicon solar panel is only going to have an efficiency rate of seven percent compared to 15% or 20% of the crystalline models. Regardless, amorphous silicon solar cells are very viable because they are inexpensive to produce. Even if the amorphous silicon solar panels are only capable of seven percent efficiency, it can often be more cost effective to purchase several of them. Being able to make solar panels at a low cost is important. Consumers need to be able to have access to this technology at reasonable prices. For this reason, amorphous silicon solar cells and panels are among the most important solar panels around. The solar panel that is being shown off as an example here is typically used in vehicles such as RV’s and boats. It is very weather resistant and can withstand extreme temperatures. Temperatures that range from -40°F to 175°F won’t be a problem for this unit. It will be easy to install it outdoors permanently too, so it’s a good purchase. You should know that there are many solar cells and solar panels that are still in the development phase. New technologies are being fine-tuned all of the time. Renewable energies are becoming more important to the world with each passing year. With the demand for solar energy becoming ever greater, the need for new solar technologies is present. Biohybrid solar cells are one of the most promising new developments in the solar energy sector. This new type of solar cell is designed to copy the photosynthesis process that is seen in nature. They are using multiple layers of photosystem 1 in order to create a highly functional solar cell. It has the potential to be the most efficient solar device ever created. As of now, the laboratory biohybrid solar cells that are being developed are far more efficient than the crystalline solar panels that were mentioned earlier. This could completely revolutionize the way that solar energy is used, and it is possible that it could become the new standard. As of right now, these solar cells are merely being researched and are nowhere near close to coming to market. It is likely that these biohybrid solar cells will become a commercially available product down the line, but this could be many years away. This is a technology that you will want to keep an eye on if you have an interest in the burgeoning solar industry. It is something that is exciting many people and it certainly showcases a lot of promise. Predicting when something such as this could make an impact on the world is not possible. It is something that you will have to wait for and then you can see what happens. The cadmium telluride solar cell is another interesting piece of solar technology that you will want to be aware of. This is something that is already being used in certain places, but it has not yet become widespread. There are several good things about this solar cell and also some negative things. The most important positive aspect of this solar cell is that it is very inexpensive to produce. Making this solar cell is pretty easy overall. It uses cadmium telluride to create a solar cell that is very efficient overall. You don’t even have to use very much water in order to make this type of solar cell, which is quite convenient. There is a low energy cost to make these solar cells and the production time is very reasonable too. This makes it a desirable option for those who wish to save money while cutting back on their use of traditional fuel sources. This is a technology that could potentially help to lower the carbon footprint of citizens and even large businesses. You might be wondering why it isn’t in regular use currently due to all of the positive qualities that it has. Simply put, cadmium telluride is toxic when it is breathed in and when it is ingested. This makes it somewhat dangerous to make use of these solar cells and it has put people off from fully committing to the technology. The information about how safe cadmium telluride solar cells are to use is somewhat murky. It could be that the proponents of this technology are ignoring the risks due to the benefits of this solar technology being so inexpensive to produce. A solar technology that isn’t safe would be completely against the core values of the solar community, so time will tell whether this technology will be developed further. It certainly won’t become prevalent if it truly is a danger to those who use it. Multi-junction solar panels stand out from normal solar panels in several ways. If you know much about solar panels, then you will know that the general amount of energy that it is capable of using is about 20% of what it absorbs. A lot of light winds up becoming heat instead of electricity, which is quite unfortunate. Multi-junction solar panels are a highly advanced type of solar panel that is much more efficient. When you make use of this multi-junction solar panel technology, it becomes possible to turn 40% of the absorbed solar energy into electricity. This drastic increase is quite impressive overall and makes it one of the most exciting and cutting-edge solar panels around. It is able to achieve this level of efficiency by having several layers of semiconductors. Each of the semiconductors is capable of converting lights at different wavelengths, which causes far less of it to be lost. As exciting as this technology is, you shouldn’t expect to make use of it any time soon. This type of solar panel is only used in satellites and laboratories at the present time. It is likely that this technology will become readily available over time, but it is currently only used by professionals in large projects. As renewable energies continue to evolve, it is highly possible that this technology will become more refined and easier for the public to consume. The largest factor that prevents this type of solar panel from being available commercially is the cost. This is very high-tech equipment and it can be costly to make. Layering the semiconductors in the proper fashion isn’t a simple task and this isn’t a practical solution for powering people’s homes at this point in time. A lot can change in a few years though, so know that this technology could be on the horizon. It’s important to be able to make use of solar technology in ways that are convenient for you. For this reason, companies have developed portable solar panels. These panels are designed to be taken with you wherever you need them to go. People make use of these convenient little solar panels to power their important electrical devices. The most popular use for this solar panel that is being shown here is to charge laptop computers. The power of the sun allows this solar panel to charge your laptop with up to a 60W output. This means that you won’t have to be concerned about running out of charge when you aren’t near an electrical outlet. It is a convenient solution for when you are going on a trip somewhere. Making use of this portable solar panel during a road trip shouldn’t be too difficult. You’ll have plenty of opportunities to charge the solar panel with sunlight and will be able to keep your devices running just fine. This is a cost-effective little charging solution that you will want to consider buying if you are in need. Flexible solar panels can be really useful in certain situations. These remarkable solar panels are built to be able to fold and can bend exactly how you need them to. It can make positioning the solar panel a lot simpler than it would otherwise be. If you would like to be able to make use of this type of solar panel, then you will be able to get one for a reasonable price. These solar panels are becoming a bit more common than they used to be. They are very durable and are also completely waterproof. You won’t have to worry about them having problems while they’re outside, so you’ll be able to make use of them very easily. Place a solar panel such as this wherever you need it to be and you will be able to make use of the power without any hassle. This unit here has a frameless design with four mounting holes. You will be able to place this wherever you need it to be and then you can fasten it to its new home. Most people make use of these solar panels on their roof, sheds, or even in vehicles. Some people have even been known to place them in tents to help power devices while they are camping. When people bring up the idea of solar panels, most people think about these traditional roof solar panels. These are commonly used to help power people’s homes. They can be placed on the roof and will soak up the sunlight in order to provide you with the electricity that you need. Many people get a significant amount of their electricity purely from solar energy. Installing one of these roof solar panels shouldn’t be too arduous. You just need to position them properly and secure them to the roof. The instructions for installing solar panels are actually really easy to follow so you don’t need to have a lot of prior experience in order to make things work. You should be able to get things up and running in a quick fashion, so you’ll be making use of solar power soon enough. The product being shown here is a complete starter kit for mounting solar panels on your roof. You will be able to make use of the abundant energy of the sun to lower your monthly energy bills. It is more convenient than you may realize and getting started is easy. If you buy this starter kit today, then you’ll be able to reap the rewards as soon as possible. You will be able to get a good amount of energy out of this setup. It is convenient, too, because you can add more to it later on if you feel the need to have more panels. This will be one of the simplest ways for people who are new to solar energy to get started.